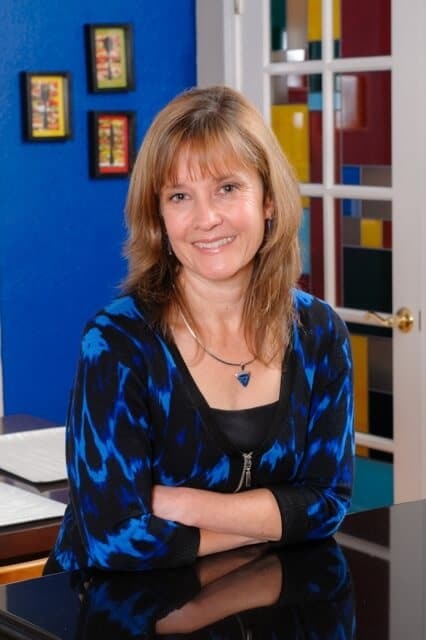 June 2015 – Anna Jacoby Interiors Paste your Google Webmaster Tools verification code here Standard interior doors are 30- 32 inches wide, but universal access requires 32 inches of clear space when the door is open, which usually means installing a 36-inch-wide door. And it’s best if the door swings outward, rather than into the bathroom. If you have the space, a wider doorway is a great thing to incorporate into your design. Grab bars: Even if you don’t think you want grab bars right now, ask your contractor to frame the walls surrounding the bathtub, in the shower and around the toilet with enough studs so that you can install them later. Manufacturers are designing aesthetically pleasing styles nowadays, so it’s definitely possible to be stylish as well as practical. 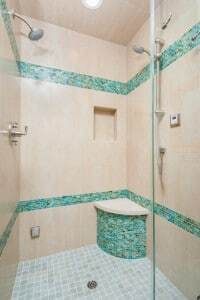 Curbless showers: Curbless showers have no lip at the floor, so people using wheelchairs or other mobility devices have no trouble entering and exiting the shower. The bathroom floor is sloped toward the drain, and an outward swinging wide shower door, or a shower curtain can help keep the water contained. It costs a little bit more in labor to install a curbless shower, as there is extra work involved. But in terms of accessibility, it is worth it. Hand-held showerheads: These can be very handy for a variety of reasons, not just for accessibility. Many people like them because it makes it easier to clean a tub or shower; others like them because it makes it more convenient for bathing children or pets. 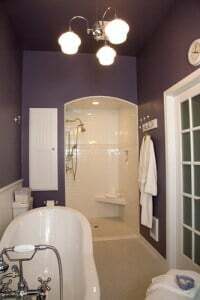 And, I’ve worked with some clients where the husband is much taller than the wife—we’ve installed a hand shower on a slider bar, so each partner can adjust the height of the shower head as needed. Bench seats in the shower: Again, these can be handy for a number of reasons. Women like them because a bench seat makes it easier to shave their legs; they also provide an extra surface for shampoo and other toiletries. If your shower space is limited, a corner bench seat can be useful without taking up a lot of space. Taller toilets: You may have noticed that toilets are getting taller. The old standard was 14-16” in height, while the new toilets are 16-18” in height. Most people prefer this new height, as it is much easier to get up and down. Consider purchasing a soft-closing toilet seat too—it’s so much nicer to have a seat that doesn’t slam down noisily. Wall-mounted sinks: If you do need to accommodate a wheelchair, then a wall-mounted sink is a must. With a wall-mounted sink, the person can get close to the sink and be able to use it easily. You forgo the storage that comes with a traditional vanity cabinet, but there are other ways to incorporate storage in the bath, and with the floor clear, cleaning is much easier. Incorporating universal design features in your bath can increase the functionality of your space, without sacrificing the beauty of the space.